I was so excited when the Braves traded for Dan Uggla after the 2010 season. I had always been a big fan of his and as much as I hated to lose Omar Infante, gaining a player like Dan made it all so worthwhile. I'm equally as thrilled that Dan has gotten off to such a better start this year. 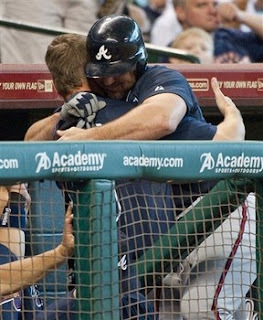 I really felt for him the entire first half of the 2011 season. Seeing how poorly he was hitting and knowing what he was capable of was sheer torture for all of us. More importantly, watching the way handled himself during that drought made me appreciate him all the more. He set a great example for all the other players in the clubhouse. And if you believe in baseball karma, it's all coming full circle. Fingers crossed, Dan will be starting at 2nd base in this year's All-Star Game. He's a great team player and apparantly, a very huggy guy! Don't forget to cast your ballot(s) for the 2012 All-Star Game. The game will be played on Tuesday, July 10th at Kauffman Stadium in Kansas City. Voting ends this Thursday, June 28th. You can vote up until 11:59pm, Eastern Time. Remember that you can vote 25 per e-mail address. You don't even want to guess how many times I voted! I've made it all quick and easy for you. Here's the link to the ballot. 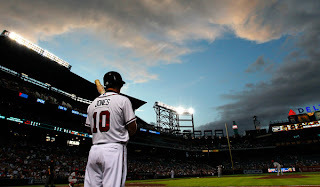 At the beginning of the 2012 season there were only two ball parks that Chipper Jones hadn't played in. Kauffman Stadium in Kansas City and the new Yankee Stadium in the Bronx. Now before you get all crazy and hit the comment button to correct me, think about it for a second. Chipper played 27 games in the original Yankee Stadium. He played in the 1996 World Series and in the 1999 World Series. He also played multiple interleague games in the old Yankee Stadium. Since the new Yankee Stadium opened in 2009, the Braves have played the Yankees in interleague play, but not in New York...not until this season. The Yankees marked Chipper's final regular season visit to their ball park with a pre-game video tribute, which featured the 27 games he played in the Bronx. The team also gave Chipper the 3rd base which was used in the previous night's game. The icing on the cake? 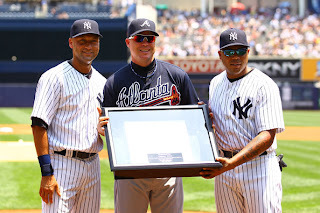 The base was presented by Derek Jeter and Andruw Jones. How perfect! Now only Kauffman Stadium is left. It also happens to be the site of this year's All-Star Game. 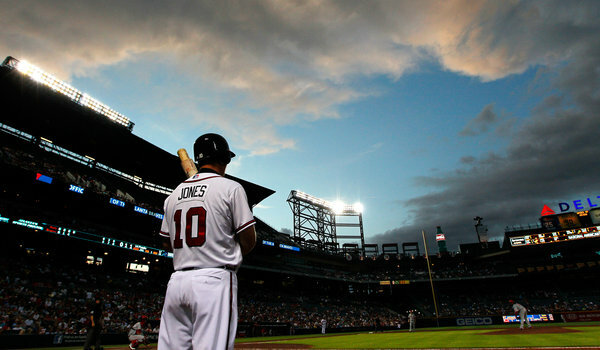 Chipper says he only wants to be voted in if he truly deserves to go. Maybe he doesn't think this season's numbers make him All-Star worthy. But what about his career numbers? Don't they merit one final trip to the All-Star Game? You decide. You vote. Chipper's tour of the Yankee Museum and his comments about playing in the Bronx and his dad's hero, Mickey Mantle. 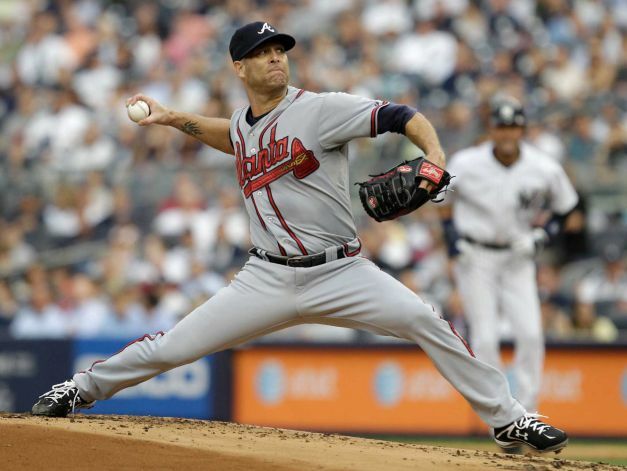 Now that Tim Hudson has pitched at the new Yankee Stadium, he has become the only active pitcher in the majors to have pitched in every ballpark. How cool is that!?! So Roger Clemens was found not guilty of perjury and obstruction of justice. Big deal. Remember, not guilty doesn't mean innocent. It simply means that the federal government did not prove its case. Did anyone even really care about the outcome of this trial? Does it really mean anything? I don't think so. In the one court that does matter, in the court of public opinion, the majority of people still believe that Roger Clemens used performance-enhancing drugs. And for that he will be forever guilty. Just like Barry Bonds. Just like Sammy Sosa. Just like Mark McGwire. Did these players think that if they didn't admit the obvious, if they held out and kept pleading their innocence, that we would eventually believe them? Do they think we're that dumb? What about the one PED user that admitted to his use when his name appeared on the Mitchell Report? What about Andy Pettitte? He seems to have come out of this unscathed. Why? BECAUSE HE TOLD THE TRUTH. He admitted it. He told us he regretted it. He told us he was sorry that he let us down. He apologized. And for that he has earned our respect. Today's news reports focus on whether this verdict will catapult Clemens back to the status of being a first ballot Hall of Famer. I hope to God not. When deciding whether a player belongs in Cooperstown, voters not only judge the nominee on his performance on the field, but they also must take into account his character, integrity and sportsmanship. In that case, Clemens doesn't stand a snowball's chance in hell. A big congrats to former Brave and all-around good guy Kevin Millwood who was part of the Seattle Mariners no-hitter on Friday! Kevin pitched six strong innings before being forced to leave the game with a mild groin strain. Five additional pitchers, Charlie Furbush, Stephen Pryor, Lucas Luetge, Brandon League and Tom Wilhelmsen kept the no-hitter intact. The Mariners ended up beating the Dodgers 1-0. This is the Mariners 3rd no-hitter in team history, the others coming in 1990 and 1993. This game marked only the 10th combined no-hitter in Major League history and it's the first one since the Astros did it in 2003. This is Kevin's second no-hitter. His first was in 2003 when he pitched for the Phillies. I guess I should also acknowledge the New York Mets (it's hard for me to use the word congratulate when it comes to them) and their no-hitter a week ago Friday. Believe it or not, it was the first no-hitter in the team's 50 year history. After 8,019 games, they finally joined the club! When you consider the calibre of pitchers who have worn a Mets uni, it's hard to believe they've never had a no-hitter. Several Mets pitchers, including Tom Seaver, Dwight Gooden, David Cone and Nolan Ryan, have thrown no-hitters while playing for other teams. It took the Mets Johan Santana 134 pitches to beat the Cardinals 8-0. But, being that it was the Mets, the game had some controversy. In the 6th inning, Cardinals outfielder and former Met Carlos Beltran hit a fastball up the left field line. The ball was called foul, but replays show that it went foul after hitting the bag. Beltran grounded out on the next pitch. Baseball is a funny game. You never know what you'll see and the human element plays a huge role in the game. Chances are good that Cardinals fans feel that the Mets still don't have a no-hitter. And Tigers fans know that Armando Galarraga did have one. Ok, Padres. It's your turn now. ...I don't like Mondays. And apparently, neither do the Braves. The team is 0-9 for Monday games. Nary a win. Nada. Rein. Just a big ol' goose egg. I think we need to do a collective rain dance next Monday. Now, when I look up high above left field, everything feels complete. It's been a little strange over the past few seasons, seeing the 31 and the 47 without the 29. We all knew it was coming, but during the wait, simply put, it felt weird. All three of those numbers, and men, are inextricably linked. Now, all feels right at the Ted. John Smoltz is right where he should be. With the Braves legends. I'm guessing that none of you are surprised that I was in attendance Friday night. There was no way I was missing it! The evening was a perfect bookend for the man I've watched pitch hundreds of times. 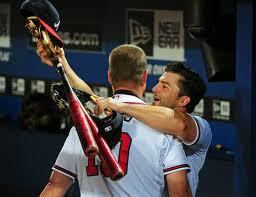 It was the perfect way for Braves fans to say thank you. And, always the classy gentleman, in his speech John Smoltz thanked us, the fans, first. It was great to see The Professor and he performed his master of ceremony duties wonderfully. John Schuerholz, Bobby Cox and Matt Diaz spoke, all speaking straight from the heart. Bobby told us what an honor it was to get to manage Smoltzie for all those years. And remember Braves fans, we owe Bobby an extra debt of gratitude for the being the architect of the trade that brought John to Atlanta. Matty, filling in for Chipper, was eloquent. What I loved most about Matty, was that the entire time he spoke, he turned away from the podium so that he was looking at John as he spoke for the players. It was so heartfelt! The Braves always do things one way, classy. Friday was no exception. I'm hoping that at some point soon, they'll air a tv special from the Hall of Fame induction luncheon, just like they did for Tom Glavine. What I really wish (hint, hint) is that they'd put the entire pre-game ceremony video on the team's website. The Cardinals did that for Tony LaRussa's ceremony and it was really nice to watch. 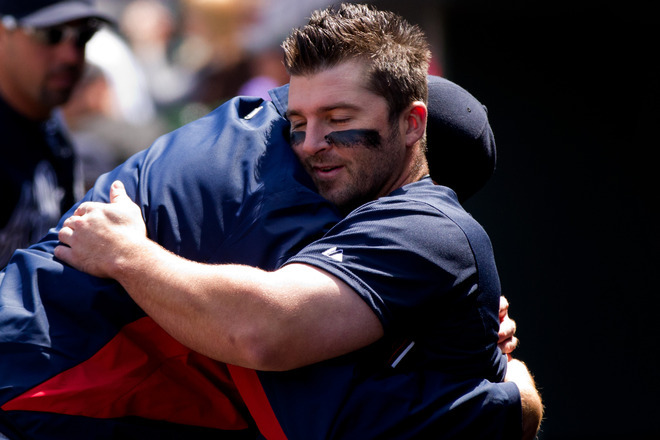 John Smoltz deserves the same. I read an interview once, where John talked about being traded to the Braves. He said he was devastated. The team he grew up loving as child, the Detroit Tigers, the team he had dreamt of playing for, had traded him to a really, really, really bad team. 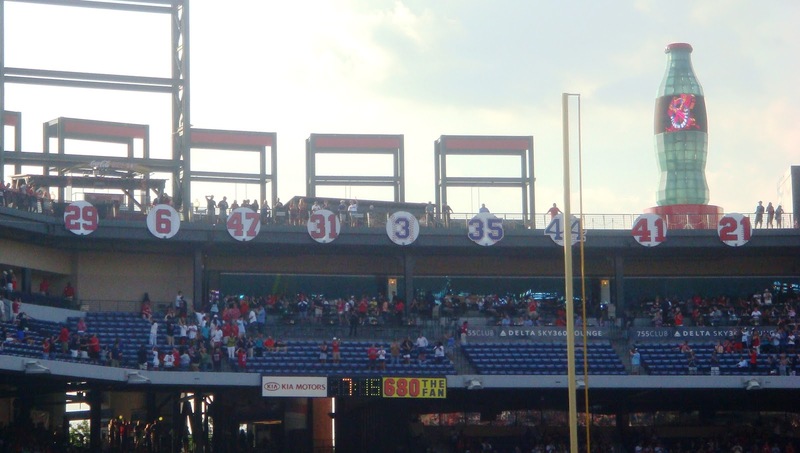 In fact, the Atlanta Braves were god-awful. But as he made the drive to Richmond, he got his head in the right place. After all, there was nothing he could do to change the situation and maybe it wouldn't be as bad as it first seemed. Bad? It was anything but. John, thank you for 20 wonderful years! The New York media hasn't always been kind to my beloved Braves. I've always felt that there's been a huge lack of respect for the organization and it's players. 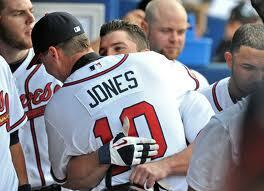 That same New York media hasn't always been kind to Chipper Jones. And that, for obvious reasons, makes me smile. All that said, here is a link to an article that ran in the New York Times on May 19th. All I can say is that an article like this was long overdue. Thank you Tyler Kepner. As I mentioned in an April post, Derek Lowe's Florida home was broken into and among the many items stolen was his 2004 World Series ring. Any member of Red Sox nation will tell you that Derek Lowe played a HUGE role in that World Series victory. In the post season, Derek went 3-0 with a 1.86 ERA. In the decisive Game 7 of the ALCS, he pitched on only two days rest, beating the New York Yankees and putting the Red Sox back in the World Series after an 18 year absence. The Red Sox went on to sweep the St. Louis Cardinals in the World Series. To say that that World Series ring was extra special to Derek Lowe is an extreme understatement. The sentimental value was priceless. After leaving Boston, Derek spent four seasons with the Dodgers and three with the Braves. He's now pitching lights out ball for the Indians and in mid-May the Tribe made a trip to Boston. Before the Saturday game, the Indians travelling secretary told Derek there was someone there to see him and they had something for him. The someone, or someones actually, was the Red Sox Principal Owner John Henry, the Red Sox President/CEO Larry Lucchino and the Red Sox Chairman Tom Werner. And that something they had for Derek Lowe? It was a brand spankin' new 2004 World Series ring. To say this gesture was classy is an understatement. 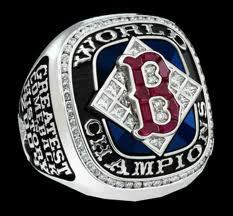 It would have been considered classy for the Red Sox to simply replace the ring for Derek. But to have the ring personally delivered by the team's top executives speaks volumes of the organization and the respect and the appreciation they have for Derek Lowe. To the Red Sox, I tip my cap! I don't mean the rain delay that's going on now in Washington D.C. but my own personal rain delay! I can't believe that I haven't posted anything in two weeks. Nary a word! Shame on me! And it's not even as if there hasn't been anything to write about...au contraire! There has been so much to write about and now I'm playing catch up! Lesson learned. So I hope that all y'all (the ever-popular plural of y'all) will give me a pass on my lack of timeliness but there are a few things that I still want/need to address. Let's go back to May 22. On that Tuesday afternoon, before the second game versus the Reds, Juan Francisco received his first lesson about the Atlanta Braves way of doing things. The lesson had to do with one of Bobby Cox's famed three rules. The rule that Juan broke? Play the game right. 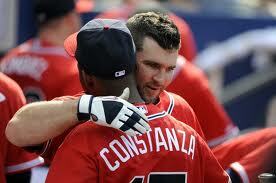 If you watched Monday night's Braves / Reds game, you saw Juan hit a home run, his first as a Brave. As the ball began it's flight toward the outfield wall, Juan stood at home plate and admired it. He then flipped his bat away and began his home run trot, in which he dragged his feet as he passed the Cincinnati dugout. 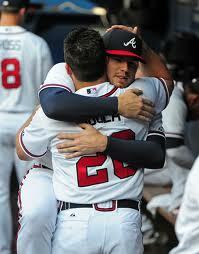 Yes, Juan maybe had something to prove to the team that traded him, but the Atlanta Braves don't play that way. If a player hits one long, they drop the bat and trot around the bases. No posing, no theatrics. Just drop the bat and round the bags. Fredi Gonzalez's quote was simple. "We try not to do that here, and I don't like that here." He continued on to say, "For me, for our team, there’s no place for that in our game." Fredi's reasons are valid. The last thing a manager wants a player to do is to anger their opponent and invite some sort of retribution. That said, there was one thing going Juan's way. The Reds know him well. Fortunately, they took the high road, although the Reds pitcher Ryan Leake said it "ticked him off." What I found the most humorous was Juan's explanation to Fredi. He told his manager, "That's just the way I do things." Seriously? 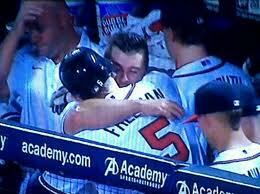 Fredi then pointed out to Juan that he's hit only 10 home runs in his major league career. One thing is for certain, Juan doesn't do it that way any longer.